2d. [Postcard message], WISH YOU WERE H(ERE). 5d. [Beverage brewed without barley or wheat], GLUTEN-FREE B(EER). 11d. [Becomes an adult], REACHES LEGAL (AGE). 22d. [How things may be rated], ON A SCALE FROM ONE TO (TEN). 59d. [Wins], TAKES THE TOP S(POT). 63d. [“Follow my command!”], DO EXACTLY AS I (SAY). 70d. [“What was I talking about before?”], NOW, WHERE WER(E WE)? The title works as a revealer, and the themers have that ironclad consistency of reusing 3 letters after the upward pivot. 21a. [Hard-to-digest food items, in slang], GUT BOMBS. Not a term I know, but a fun entry. 94d. [Bright spot? ], DOG STAR. Is this supposed to be playing on both “bright spot in the sky” and “brightly famous dog named Spot”? Seems weird. 74d. [Bone whose name means “clasp” in Latin], FIBULA. I am not up on all my classical bone etymology. 4d. [Line in Gotham], BATPHONE. Another fun entry. 10d. [Mercury had 26 of them], MISSIONS. I was thinking of the god Mercury rather than the NASA program. Four stars from me. Solid Sunday-size offering. Mid-April brings allergies, income tax payments, and the usual rush as another semester and school year starts to wind down. This week’s puzzle is a pleasant distraction from the chaos of work and school. What’ll I do becomes WADDLE I DO, clued as a [“___ with this duck costume?”]. I see what you did there, Merl. Where are your glasses becomes WARIER GLASSES [and why aren’t you more careful with them?]. Why are we stopping becomes WIRE WE STOPPING [at Western Union?]. How are things becomes HAUER THINGS [with that “Blade Runner” guy?]. Translation: Actor Rutger Hauer played Roy Batty in the film Blade Runner. When are we going morphs into WENNER WE GOING [to meet the founder of Rolling Stone magazine?]. Jann Wenner is the founder at issue here. Get it? Issue? With a little hocus pocus, Which is worse turns into WITCHES WORSE [, a hex or a spell?]. Can you help me becomes KENYA HELP ME [find this country on a map?]. I probably can’t, but I bet a Mary can. May we proceed gets a little Frenched up to become MAIS OUI PROCEED [despite your objections, Monsieur?]. Are there any more questions turns into ARTHUR ANY MORE / QUESTIONS, a nice long ending to the theme that requires division into two answers. Despite the theme density, Merl shows off a bit, what with the stacked theme entries in two corner and the stacked sevens in the other corners. Those added elements made the puzzle more enjoyable. 4. The crossing of [Early rights activist Sarah] PUGH and ROUEN, the [Site of Joan of Arc‘s demise] isn’t exactly a gimme. 3. (Okay, now the legit toughies start.) RENI is the [Santoni who played Poppie on “Seinfeld”]. I watched Seinfeld when it aired and many times in syndication. I remember Poppie well. But Reni Santoni? Not so much. 2. U.S. SUGAR is the [Corp. that owns 188,000 acres in Florida]. That clue seems like it’s desperately trying to make the answer legit. It’s noteworthy because it owns a lot of land! But c’mon, U.S. Sugar is no U.S. Steel. In fairness, the land purchase was apparently a big deal in Florida news, and Merl lives there. So our Floridian readers may have had no problem with this one at all. 1. ELYRIA is a [City near Cleveland]. Wikipedia tells me the population of Elyria from the 2010 census was 54,533. If you combine it with nearby Lorain, Ohio, you have an urban area that makes it the 191st largest in the United States by population. Left to its own, though, Elyria would barely crack the top 500. So what I’m saying is that I’ve never heard of it and maybe that’s true for lots of others too. That it crosses RENI probably makes this even harder. Hmm, the clue for I-TOOLS is [Early service software from Apple], and yet the grid contains APPLE SEEDS, clued not as [Spreader Johnny et al] but as [Core ingredients]. 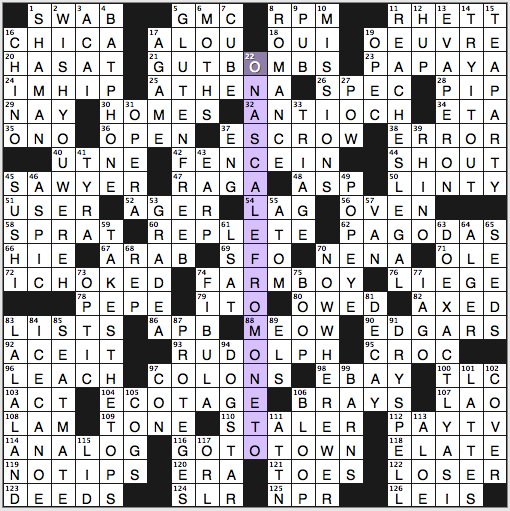 Normally you don’t want significant grid words appearing in the clues. But this tends not to bother too many people, so I guess we’re at the nit-picking stage now. Better wrap it up. Favorite entry = ENCIPHER, clued as [Convert to code]. Favorite clue = [Electrician’s chant?] for OHM at 113-Down (hi, mickey!). Last week on this blog, I hatched a scheme wherein I would print the Sunday LAT and physically highlight certain entries in order to enhance the blogging experience. Predictably, I got lazy and went back to solving on Across Lite instead. I may still make good on my goal of solving more on paper this year, though, as I’m printing out some of the NYT puzzles from the Fill Me In era and solving them as I listen to the episodes for the first time. 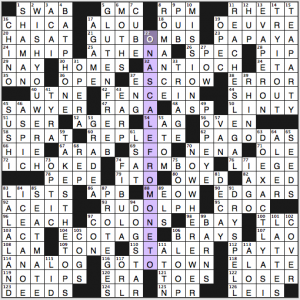 66a, THE [Word that precedes the start of each answer to a starred clue to form a 112-Across best-seller]. I don’t think this is the first time THE has been used as a theme entry, but it’s probably the best so far. 112a, JOHN GRISHAM [Author with over 275 million books in print]. This refers to actual physical books, though it seems like John Grisham has written 275 million actual distinct titles. 28a, BRETHREN COURT [*Pirate lords’ group in “Pirates of the Caribbean: At World’s End]. 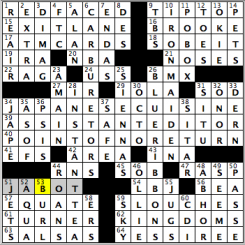 This seems not quite famous enough for a mainstream print puzzle, but here I am, quite apparently being wrong about that. Plus, how else are you gonna work in The Brethren? 34a, SUMMONS UP COURAGE [*Rises to the occasion]. I don’t know if “summons up” is as common as just plain “summons” in this context, as in “summons courage” or “summons the courage (to do something).” But I’ve been wrong as recently as the last theme entry, and even if I’m right, that’s the price of symmetry. 59a, CHAMBER MUSIC [*Trios and quartets, e.g.]. Funny how a “trio” can mean a group of three people, and a piece for a group of three people. This clue refers to the latter. 71a, PARTNER DANCE [*Salsa, e.g.]. Sure. 93a, ASSOCIATE DEGREES [*Some undergrad awards]. Sure again. 100a, FIRM BELIEVERS [*They’re hard to sway]. Sure x3. The Client, The Brethren, The Summons, The Chamber, The Partner, The Associate, and The Firm. Too bad there’s not a lot of phrases that start with Pelican Brief. I love this theme structure. From the beginning, the ball is hidden. You have an opportunity to figure it out halfway through, at the central THE, if you know who wrote The Firm or The Brethren etc., but there’s also the giveaway at 112a. A niche theme, but executed simply enough for those not conversant in Grisham (read: me) to pick up on quickly. A quick rundown of my favorites: HOTEL BAR, REPUBLICAN, MONOTONY, CHROME/PANDORA (one tech clue, one myth clue), TAKE A SPIN, CUTIE, ELLE GIRL, LINE ITEM, MAJORETTE, MINAJ, RAT RACES, BELARUS/PAGANINI, LEAD ROLE. Heck, I even liked WINE JUG with the Rubaiyat clue. That’s a ton of stuff, and I’m only listing the very shiniest parts. 55d, HERBARIA [Collections of plant specimens]. I guess this is the plural of herbarium. If I had to guess what a herbarium was, this is what I would guess. 11d, MOTHER WIT [Good sense]. Completely foreign to me. Should I know this? When was this a popular phrase? I certainly don’t mind learning about it, but I needed all the crossings on this one. The worst fill in here is probably PETTI [Clothing prefix meaning small] (why not PETRI crossing CURIE?) or crossword mainstay Theda BARA (unavoidable, and not terrible by any means). I also had a bit of a snag on the crossing of SAW RED and Weeb EWBANK (really wanted EUBANK, which made the non-word SAURED, but I figured it out quickly enough), but that’s not meant as a knock on the puzzle. My prayers for a better puzzle this week were answered! Solid theme, buoyed by nice fill. 4 stars. Until next time! I not only had fun with today’s Sunday Challenge, brought to us by Mr. Martin Ashwood-Smith, we also have an answer that once described my job at ESPN The Magazine: ASSISTANT EDITOR (39A: [Masthead credit]). 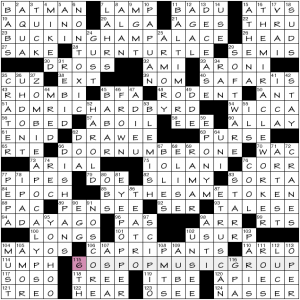 I’m now on the freelance side, and have done a little more editing and a lot more researching, but seeing a title that you used to own in a grid is definitely going to make you perk up a little! 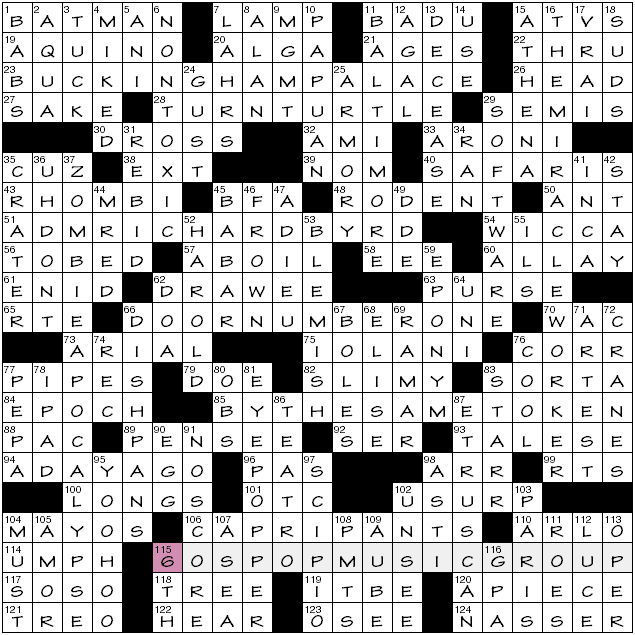 The other answers forming the triple stack in the middle were good fill as well, and really like the clue for, and the answer of POINT OF NO RETURN (40A: [Committed people pass it]). Usually have to hop around a Sunday Challenge grid to see where I can get a foothold, but didn’t need to with this one, as the Northwest got me off to a good start when I filled in RE-AIR (1A: [Put into TV syndication]) and trusted my gut to put in ATM CARDS after just seeing the first “A” filled in (17A: [They’re obtained from branches]). 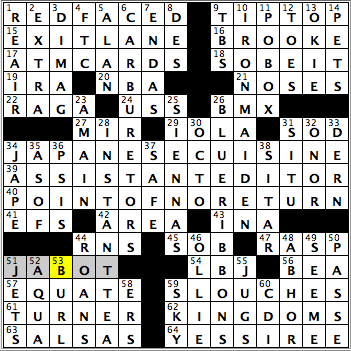 Oh, and it didn’t hurt that there was a sports clue up there as well, with DIMAG, short for DiMaggio (3D: [Joltin’ Joe]). I initially thought of a country (or some place) for PO BOX (11D: [Disallowed FexEx destination]), but was on to that fairly quickly as well, especially after getting BMX in a snap and seeing the “X” at the end (26A: [Extreme sport, for short]). Didn’t have too many slowdowns really, though JABOT was a challenge for me, and needed its crossings to make sure of that (51A: [Frilly neckpiece]). Oh, and how many people on here had an earworm after filling in IRON MAIDEN (10D: [Stereotypical dungeon prop])? If not, here’s 3.5 hours worth of Iron Maiden earworm goodness! “Sports will make you smarter” moment of the day: OLLIE (46D: [Aerial skateboarding maneuver])– A quick double feature for our sports clue. In skateboarding, an OLLIE is performed when a skateboarder puts pressure on the skateboard with his back foot to lift the skateboard off the ground and perform a jump/trick. Or, you can go with current University of Connecticut men’s basketball head coach Kevin OLLIE, who coached the Huskies to the national championship last season. Oh, and I wrote a feature on Ollie (and Iowa State coach Fred Holberg) during last year’s NCAA Tournament. Wanna read it? If so, here it is. You’ll enjoy it, even if you’re not a sports fan. Have a good rest of your weekend, everyone, and thank you for your time all week long! Revealer/explanation over in the lower right: 115a [Pluralize a word in each * answer to name a ___ ] 60S POP MUSIC GROUP. (The 6 crosses 115d [“Geese a-laying”] 6TH. 23a. [*London landmark] BUCKINGHAM PALACE (The Buckinghams). 28a. [*Capsize] TURN TURTLE (The Turtles). 51a. [*Polar explorer] ADM RICHARD BYRD (The Byrds). Unsignalled abbrev. 66a. [*”Let’s Make a Deal” option] DOOR NUMBER ONE (The Doors). 85a. [*Similarly] BY THE SAME TOKEN (The Tokens). 106a. [*Mid-calf wear] CAPRI PANTS (The Capris). Probably the least recognizable group of the lot. 16d. [*Keller biopic] THE MIRACLE WORKER (The Miracles). 37a. [*”World War Z” event] ZOMBIE APOCALYPSE (The Zombies). Tangentials: 110a [Singer Guthrie] ARLO, 83d [Fab Four member] STARR, 40a [Expeditions] SAFARIS. 104d [Gotta] MUST. And the reverse of that sort of colloquialism/shortening (unannounced): 83a [In a way] SORTA, 22a [Via] THRU. Some other randomness: 94a [Very recently] A DAY AGO, 114a [Grunting sound] UMPH. Strangest of all: 36d [“__ you cry for me!”] UH DON’T. Really? Lots more rough fill, including: 75a [Royal residence in Hawaii] IOLANI, 123a [Douay Bible prophet] OSEE, 109d [Seine feeder] AUBE, 62a [Bank, in a check transaction] DRAWEE. Lots of abbrevs. ATVS, WAC, RTS, ARR, PMTS, MGMT, RTE, OPER, SER, OBS, and many more. Interesting clue: 76a [Right or write (abbr.)] CORR – that’s correct and correspond. 4d [Ready for karaoke] MIKED. Not DRUNK, surprisingly. 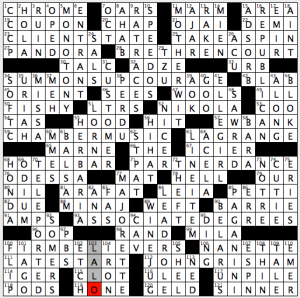 Favorite clue: 87d [Po boy?] ETRUSCAN. This entry was posted in Daily Puzzles and tagged Alex Vratsanos, Henry Hook, Jeff Chen, Martin Ashwood-Smith, Merl Reagle. Bookmark the permalink. DOGSTAR was my last solve. Just a pun on Sirius (or the Keanu Reeves band), presumably. Agree on the puzzle overall. Really solid, especially given the length of the theme solves. The NYT was fun enuf. Really enjoyed Jeff Chen’s NYT today. When I first looked at the empty grid, I thought the puzzle was going to be all chopped up, but the solve seemed very smooth. Just the right amount of cleverness (for me) in the cluing for a Sunday, and a lot of variety – pop culture, music, sports, proper names, etc. – but not “too much” of any of them. A very pleasant Sunday solve. I had an idea from the title how the theme would play out, but even after I had REACHES LEGAL filled in, it still took me a little while to find the AGE! One question on 9d – I have a local pub that I frequent, but the terms don’t seem interchangeable to me. Or was this an abbreviation for public (still doesn’t seem quite right)? Thanks for the explanation – maybe I’ll adopt the convention, too. The answer slowed me down for a while – I ditched RPM at one point so I could put “bus” in for local, thinking of local vs. express. The RENI/ELYRIA cross in Merl’s puzzle was just silly. I got it right, but only through a complex process of evaluating the compound probability of the personal and municipal names for each vowel, a.k.a. guessing. Supercollider was never built. But apart from that, particle accelerators don’t smash atoms. The LHC at CERN mostly does proton-proton collisions, but can also work with some heavy nuclei. Not atoms, though. NYT: Excellent fun! GLUTEN FREE BEER was the first theme entry that I had wanted to put down, and when it didn’t fit, tipped me to the trick. How clever to see these reversals! I’m very impressed with the theme and execution. What a Sunday puzzle should be. Chentastic as usual and much fun. Shout out to the Grid Kid if he invented the gimmick. Have you thought about links here opening in a new window, Mr. Sullivan? I think that’s completely up to the person posting the comment. <a href=”http://somesite.com”>link text</a> takes you away from the page whereas <a href=”http://somesite.com” target=”_new”>link text</a> should open in a new window. the central entry includes a sequence of four circles that highlights ECHO in “THE CHOSEN O[NES]” to indicate the turn back. I pretty much agree with everything Andy said about the LAT, though I wanted MONOTONE for speech problem rather than MONOTONY to begin with, easily fixed. I’ve never heard of HERBARIA either, but sure. My only issue is TELEPORTED — with the clue invoking Scotty’s help, I confidently filled in TRANSPORTED until I realized it didn’t fit. It’s the Transporter Room, not teleporter room. Got fouled up for a while after I confidently filled in COP for 8-A (“Capture”) in Merl Reagle’s puzzle. Turns out, it was supposed to be NAB. This is your fault, Martin! 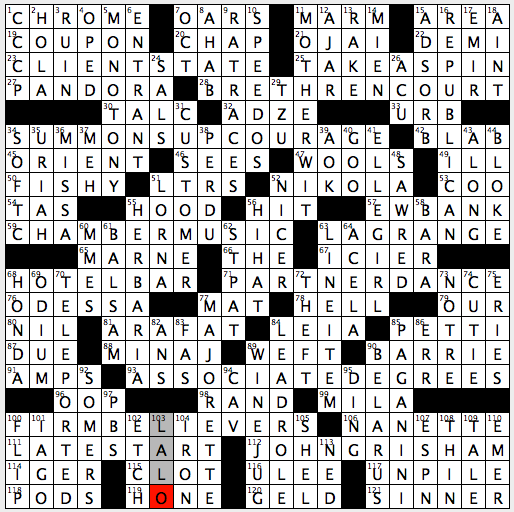 CRooked – The 6OS start to the revealer left me flat. I tried to see a deeper theme. I entered SIX as a rebus in 155d. Then I put TIE in next to it in 115a. SIXTIES looked good. And a no score game is a TIE game, but I couldn’t make it work. 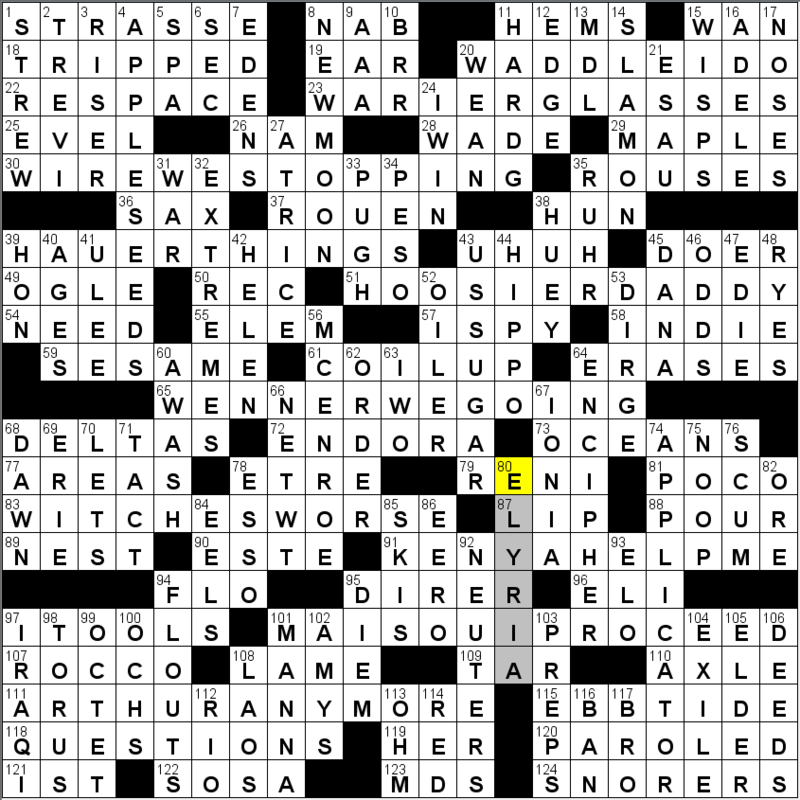 That anomalous single-numeral thing is relatively common in Hook crosswords. While not something he requires of himself, he apparently has no hesitation to include them. Pete Muller has been doing so lately—with rebus squares—in his meta puzzles (but I hope you won’t let that preclude you from solving them!). I think it’s the ‘O’ instead of a ‘0’ that causes my dissonance. It definitely won’t slow me down on Hook or Muller. Do these guys have other puzzles available? I subscribe to Crooked and MMMM. 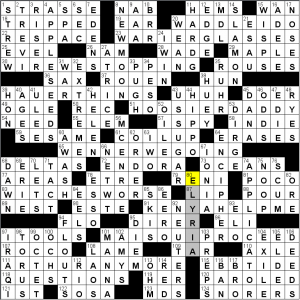 Washington Post Daily Crossword changed their interface, seemingly to be more phone-friendly. But it has made it unpleasant, unusable on my iPad. Glad the Sunday puzzle is still the same! Thanks for the shout out Sam for the 113 Down clue. It was my favorite clue and answer also. I’ve been doing Merl’s puzzles since he was in the Image Magazine in the Phila. Inquirer in the very early 70’s. He’s quite clever, and one of the best, if not the best puzzle constructor out there. I really enjoy his work. Talk to you soon.